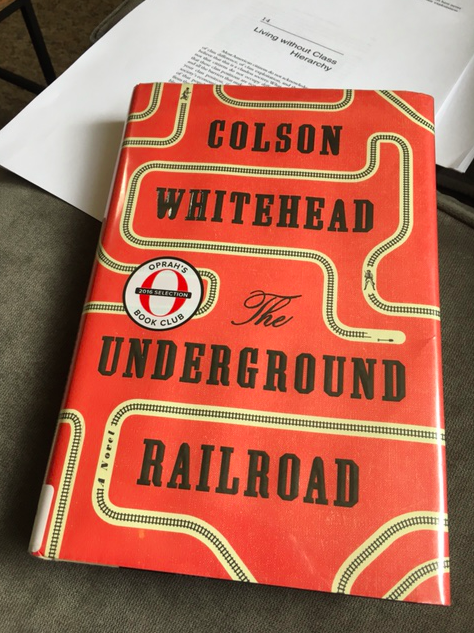 Colson Whitehead’s The Underground Railroad: A Metaphor – The Bookshelf of Emily J.
Colson Whitehead’s The Underground Railroad (2016) tricked me for a moment. It portrays the famous underground railroad, a network of abolitionists and volunteers who helped slaves escape the south and head north in nineteenth century America, as an actual railroad with trains and tunnels. I thought that I had somehow missed something in history classes, and then I realized that portraying the underground railroad as an actual train was metaphorical and magical. The book is about Cora, a slave in Georgia who runs away for freedom. Her story is surrounded by the story of her grandmother Ajarry who never ran and her mother Mabel, who ran and never returned. People on the plantation see Mabel as a beacon of hope, somebody who was successful in escaping slavery. (The end of the book dampens the awe that we are meant to have for Mabel, but I won’t give that away.) Cora manages to escape, and she has a pleasant time at first, but her experience has a dark side, especially when those who care for her encourage her to be sterilized. She ends up having to run again because of a slave catcher, and spends months in a small, hot attic, only to be caught. Yet again, she has a chance to run, and yet again, the slave catcher finds her and others. This is the basic plot and pattern of the book. It is not, however, what the book is really about. It isn’t about Cora or the slave catcher or the people who help and hinder her along her way. The actual underground railcars are metaphors for an underground side of the United States that we often ignore. There is an underground of the American dream, a dream that is never reached and that many constantly chase only to be snatched away from it again by forces that will not stop oppressing and chasing. As one of the abolitionists tells Cora, “If you want to see what this nation is all about, you have the ride the rails. Look outside as you speed through, and you’ll find the true face of America” (p. 262). What Cora sees, in the damp, dark tunnels, is blackness and blankness. Cora’s first few months in freedom are pleasant. She is dressed nicely, taught how to groom herself, and educated. But then she sees a doctor and is told that she should be sterilized. She is alarmed, despite the fact that this suggestion is made slyly and carefully. She also hears about other dying from syphilis, and my thoughts turned to Tuskegee. And my mind protested: that didn’t happen in the 1800s! And then I thought: but it did happen. And then I understood the book, with its actual underground trains and its persistent slave catchers and the continued misfortunes and the hope that continued on despite all of this. I understood that it was a magical book, not in the way that makes readers question reality, but YES in a way that makes readers question their perceptions of reality via history. Cora hears about Manifest Destiny, and as we experience the narrative through her eyes, we know that such a destiny will never include her. The slave catcher explains, “It means taking what is yours, your property, whatever you deem it to be. And everyone else taking their assigned places to allow you to take it. Whether it’s red men or Africans, giving up themselves, giving of themselves, so that we can have what’s rightfully ours” (p. 220). What a horrific way of seeing prosperity, that it must somehow come at the expense of others that have been deemed as less-than. A universal idea that I found philosophical is when Cora saw a free black woman who bore a large ugly branding scar from her time in slavery. “Cora thanked the Lord that her skin had never been burned in such a way. But we have all been branded even if you can’t see it, inside if not without” (p. 254). We have all been branded in some form or way. Some might be worse than others. I think what I take from this idea is that we can therefore be gentle and kind to everybody, even ourselves. We may not be able to see what struggles people are facing, but we can certainly practice courtesy, respect, and give them the benefit of the doubt. When she finds refuge in the late stages of the book at a place called Valentine farm, where many black people and former slaves work together, Cora learns that “Freedom was a community laboring for something lovely and rare” (p. 272). Yet this does not last. Before they are raided (again), Cora learns from the others that their peace at that farm is an illusion. “And America, too, is a delusion, the grandest one of all. The white race believes—believes with all its heart—that it is their right to take the land. To kill Indians. Make war. Enslave their brothers. This nation shouldn’t exist, if there is any justice in the world, for its foundations are murder, theft, and cruelty. Yet we are here” (p. 285). Those are sobering words, and reflect a lot of what recent events have revealed about people in the United States. We are not “post-racial.” After reading this book, understanding the metaphors, studying American studies, engaging in social justice causes, trying to walk in others’ shoes, and living through the last several months, I’m not sure that we have made much progress at all. I hope that we have. I still have hope, and perhaps that is what this book is also about. Cora has hope always. “The Great War had always been between the white and the black. It always would be” (p. 288). The book is a clear and eloquent critique of racism, classism, and capitalism in the history of the United States and in current times. While engaging, beautifully written, and compelling as a piece of fiction, it is also an important piece of commentary on what we can do better and how we can recognize the wrongs that still need to be righted. There is much work to be done. The Great War is not over. Right on. It seems like bell hooks’ ideas about focusing on giving rather than just getting is instructive to civil rights work as well. A terrific analysis, and I can’t wait to read the book. I have an opportunity to see Whitehead speak in a couple of weeks, so it’ll be interesting to hear him amplify some of these themes. Oooh, I’m so jealous that you get to see him speak. Let me know what he says! Wow! That’s amazing. Hurray! That’s a win. This is your best review yet! This has been on my list and I’m moving it up. The political climate of late has been very disappointing as it does seem we’re undoing any progress we might have made. The upside is that average white folks (me & others like me) are having the conversations and engaging in the reality of racism and not sitting idly, silently by accepting the privilege that exists as manifest destiny anymore. We’re working on awareness. Things can get better and more equitable if we work this stuff out. So there’s where my hope lies. You said it more eloquently but I agree. There is an upside, and I have to keep reminding myself of that. But yes, we are all so much more engaged and active than we were and that matters. Thanks for the great comment! I guess I don’t really get what is gained by portraying the Underground Railroad, which phrase is a metaphor, after all, so literally. “This nation shouldn’t exist…” – I often think about that. About what it would be like if Europeans hadn’t felt the need to sail around and take everything. I feel the guilt, even though I tell myself I didn’t do it. I walk around wishing I knew how to undo it. Beautiful review, Emily. I’m glad I read this before reading the book – I think it’ll help me get more out of it. I hope you like the book. The story on its own is engaging and well written, but the underlying message is also poignant. You’ll probably notice more than I did. I look forward to seeing what you think of it! Thank you for such a thoughtful post, Emily. This is definitely on my TR list and I agree with Naomi – I will get so much more out of the book having read your review first. The quote you included – “Cora thanked the Lord that her skin had never been burned in such a way. But we have all been branded even if you can’t see it, inside if not without” – will stay with me. Yeah, that was a powerful moment for me too. I hope you get a chance to read this one. I loved it! I hope you enjoy it too! It really isn’t dense, just full of meaning and metaphor. This is the most thoughtful review of this book that I have read – thank you! I also want to say that this might be my favorite blogger review of this book. It clearly is not just about what happened in America’s past but how it still resonates today and what is STILL happening today with race and class. I just loved this, as hard as it was to read sometimes. I hope lots and lots of people read this, not just people open to the idea of working for social/racial justice. Thanks for your review! That is high praise! Thank you! I do hope many read it as well. There is so much to it, and it illuminates the past while reminding of us how much work is still left to do in the present. This was well-written and thoughtful. I look forward to reading the book. It definitely sounds similar to the same themes present throughout black literature, dating all the way back before the early 1900s and DuBois. Absolutely. Whitehead has embedded his work within a tradition. Thanks for reading! Emily, thank you for this brilliant book review and also your honoring ideas. The book is great but reading reviews like the one above just helps better shape the moral of the overall story. I’m a fan! Oh wow. Thank you for your kind words! What a wonderful review and analysis. I am going to recommend this for my book group. Thanks! I hope your group likes it! There is so much to discuss, so I can see this one being an excellent choice.